One of the goals of the APRM is to set benchmarks for good governance and we can see a move in this direction in the concrete deliverables of some of the NPoAs. For instance, following its participation in the APRM process, Kenya operationalized the Micro-Finance Act, and implemented a 14% increase in credit available to the private sector between 2005/6 and 2006/7. In Ghana, the progress reports on implementation of the programme of action document an increase in primary and secondary school enrolment following the identification of low enrollment as a stumbling block to Ghana’s development. The APRM process has also made a noteworthy contribution to the realisation of the rights of people to participate meaningfully in their self-development – a right enshrined in the African Charter for Popular Participation in Development (1990). The implementation of the APRM process in Algeria in 2007 for example was considered by many a technical success in a country where traditionally dialogue between government and its constituents and members of civil society is rare. By “mainstreaming” governance through the APRM process, citizens were equipped with the opportunity to have a voice in identifying governance projects which are prioritized for peer review and assistance. Finally, the process has opened state management to scrutiny. Historically, accountability on the continent has been directed towards donor countries and agencies. In the early days of NEPAD and the APRM, African States were still focused on solidifying external relationships, utilising the laudable goals of the APRM as demonstration of their commitment to democratic principles and good governance. This justifiably brought on criticism that the APRM was a disguised externally-driven agenda, and not the result of a home-grown initiative. But there is now a shift in the right direction. A major achievement of the APRM is that the process has diagnosed and highlighted systemic and structural issues that affect most African states in their governance systems and pose barriers to sustainable economic growth and development. Generally the APRM country review process has revealed four major systemic issues: 1) management of religious, or ethnic diversity; 2) land and resource governance; 3) corruption and 4) elections and electoral management. A fifth which could be added to this shortlist is mismanagement of human capital and resources. Africa has the youngest population in the world with about 200 million people between the ages of 15 and 24. Unfortunately this has translated into a high incidence of youth unemployment which in the long run poses a significant challenge to development, and political stability. In counting the successes of the APRM, one cannot lose sight of the shortcomings. Lack of political will continues to be a stumbling block, affecting the financial and human resources necessary for the Mechanism to fulfill its mandate. Similarly, the APRM process has been criticised in that some countries’ NPoAs are mere carbon copies of pre-existing development initiatives. Finally, the APRM process has also been criticised for the failure of some reports, such as the 2011 Mali Report and the 2006 Kenya Country Report to give sufficient attention to early warning signs of the crisis in Mali and the 2007-2008 post-election violence in Kenya. The Next Ten Years: Which Way Forward? As we navigate the next ten years of the APRM, it is evident that political will at both continental and national level is crucial for the APRM to achieve its goal as a process for development. It is through political will that the financial and logistical challenges which impair the process at various levels can be overcome. That said, it is also clear that one of the real challenges to the APRM’s success is an insufficient focus on implementation and on-going monitoring. Much attention is placed on the process of the country self-review, the country report and its presentation at the continental level; however, even though progress reports are required, the structure is lacking at the continental level for proper monitoring and evaluation. 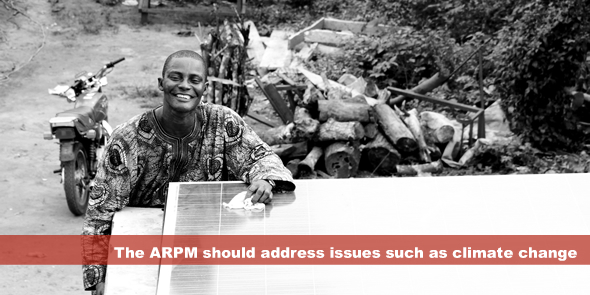 It is important to shift the focus away from a mechanical implementation of the APRM stages. The peer review should be considered the beginning – a precursor to the important step of implementation and monitoring. Additionally, the APRM process should be more aligned with issues which have been highlighted at regional and continental levels as challenges to Africa’s development. These issues include investment in healthcare, climate change, youth unemployment and development of the informal sector. Given the important role the informal sector plays in most African economies, and the fact that Africa has the youngest population in the world, it is essential that the APRM NPoAs and strategies coincide to focus on removing the obstacles and challenges faced by the young, the poor, and the voiceless. How can this be done? The first and important step is ensuring the NPoAs contain concrete recommendations and strategies rather than vague aspirational statements which are difficult to measure. Taking healthcare as an illustration, the right to the best attainable state of physical and mental health is enshrined in Article 16 of the African Charter on Human and Peoples’ Rights. From an implementation perspective, actualising such a right requires health sector reform, and investments in healthcare through public-private partnerships. In its 2007 – 2015 Health Strategy, the NEPAD Agency put forward several strategies at national, regional and continental level which would work collectively to implement the right to healthcare. These strategies include facilitation by the African Union of a common position on migration of health professionals and a steady increase at national level of the budget allocation for health to at least 15% (a target set by Heads of State in the 2001 Abuja Declaration on HIV/AIDS, Tuberculosis and other Infectious diseases). According to a World Health Organisation Fact file published in 2011, only 2 African countries, Rwanda and South Africa, have achieved the Abuja Declaration target of “at least 15%”. Achieving this goal should be a priority. Yet, none of the publicly available APRM country reports completed between 2007 and 2012 include the recommendations contained in NEPAD’s Health Strategy, particularly the recommendation to increase the budget allocation for healthcare. Algeria’s country report was published in 2007, and the APR Panel observed that reduction of the rate of mother and infant mortality was a priority. Despite this, the action plans recommended were vague. For instance, it is noted that Algeria would “increase the social welfare budget” – what to, was not stated. In addition, the then programme of action was to “bolster the national programme for handling premature births”. How this would be bolstered was again not stated. Lesotho’s country report was completed and published in 2010. Despite noting that access to health posed a great challenge to Lesotho’s development and that Lesotho faced a serious shortfall in qualified medical staff, there were no concrete steps recommended for Lesotho to adopt. 9 March 2013 has been proposed by the African Union as “APRM Day” – a day to raise public awareness of the Mechanism and its achievements. In doing so let us not forget that as a dynamic model for Africa’s development, the APRM can achieve much more at a continental, regional and national level than it is currently doing. If the successes of the past ten years are multiplied and the lessons from the mistakes are learned, the APRM would not only be viewed as a legitimate process for Africa’s development, it could also lay the framework for a peer review mechanism which could be adopted in other regions of the world. Prior to joining the World Bank Adejoké Babington-Ashaye was an Associate Legal Officer at the International Court of Justice (ICJ) and an investigator in the Office of the Prosecutor of the International Criminal Court (ICC). She holds a LLM in Public International Law from the London School of Economics and is a qualified Attorney in the State of New York. She is Co-Chair of the American Bar Association Section of International Law Africa Committee.